We’ve had the pleasure of talking with and featuring many PatientsLikeMe members on the blog over the years, but Nate is the youngest by far. 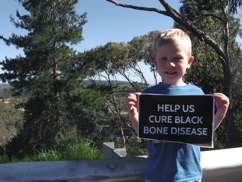 He’s just 5 years old and is living with Alkaptonuria (AKU), a rare metabolic disease, sometimes called Black Bone Disease. Recently, we had the chance to chat with his mom, Alycia, who spoke with us about Nate’s experiences with AKU and her role and philosophy as his caregiver. To get started, what would you like everyone to know about your son? My son is an extremely happy and energetic 5 year old. He has recently started school and loves playing sport. His favourite sports are cricket and Australian Rules Football. He has a younger brother who he loves getting into mischief with. He also has a rare Metabolic disease called Alkaptonuria. However, we have chosen not to tell him about his disease at this stage. Do you remember what the first sign or symptom was? And can you talk a little about the diagnosis process? The only symptoms he had were black urine and dark ear wax. We never really thought much about his dark urine because we only noticed it when he had accidents during toilet training and as he is our first child we didn’t know any better. When Nate was 3 he was hospitalised with post infectious glomerulonephritis. About 6 months later his kidneys had recovered but his test results were still not normal. With further investigations he was diagnosed with Alkaptonuria. Now the unusual urine stains make sense. Can you tell us a little about your day-to-day experiences as a caregiver? Due to the slow progression of Alkaptonuria, caring for Nate on a day to day basis really isn’t much different than for any other mum. The only things I do are to ensure that his ears don’t have any visible ear wax, as we’re very conscious of him being picked on. I also have to take him to a few extra medical appointments as he is under the care of the Metabolic team. How has connecting to other caregivers, or others living with AKU, on PatientsLikeMe impacted you? I was devastated when Nate was diagnosed with AKU and even more so when I found out how rare it was. I wanted to gather as much information as possible to help me understand and to help ease the way I felt. It wasn’t until I found the AKU Society in the UK and then PatientsLikeMe that it helped to alleviate some of those feelings. It’s been great to have a group of people who truly understand the disease and who you know will never judge you for any question you ask. As a carer it’s my job to research as much as I can about AKU so when the time is right to tell Nate I can provide him with this information and he can connect with everyone on PatientsLikeMe himself. PatientsLikeMe has really had a positive impact on my life, at times it’s been comforting to know what potentially could happen to Nate and the quality of life he may have, but the benefits of having access to this site help outweigh some of these feelings. If there was one thing you could tell everyone who is caring for someone living with AKU, what would that be? Use all the resources out there like PatientsLikeMe and the AKU Society, which are amazing tools for reaching others who understand AKU better than anyone, fellow patients and carers, to research as much as you can about the disease. I believe that there is a potentially bright future for AKU patients if Nitisinone becomes available. I also greatly believe if you’re a caregiver to a child with AKU, to let them be a child and let them have the childhood every child deserves and don’t weigh them down with their disease until you absolutely have to. Unfortunately the AKU will always be there. This is wonderful – thank you for sharing. As an adult who was once a child with AKU – I can agree with all of it. Hopefully Nate will have the advantages of what we are learning now and not have to have any of the effects that come later in life. Blessings to your family.